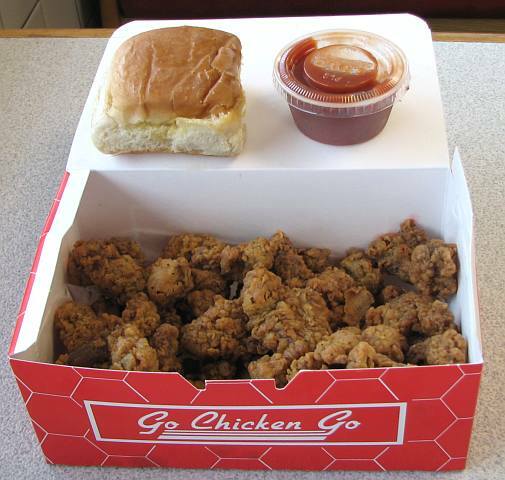 The first Go Chicken Go was started by Bill and Mary Hendrx in Kansas City, Kansas in 1969. They opened their fried chicken restaurant in a "Go Gas" gasoline station. 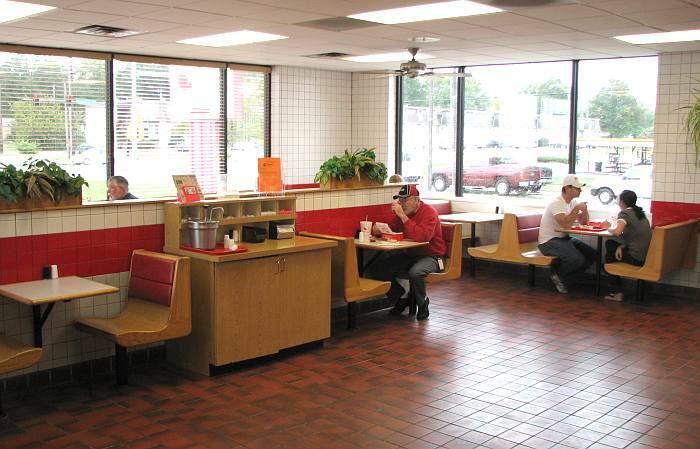 Their three sons purchased the restaurant in 1985 and expanded to 5 restaurants, including this location in Olathe, Kansas. Up until first preparing this review, I had only tried Go Chicken Go's fried gizzards and livers. The gizzards are particularly popular where I work and when someone makes a Go Chicken Go run, they end up bringing back at least 6 orders and a few extra servings of the secret hot sauce "G-Sauce." But preparing this review I tried several items. I wasn't impressed with the mashed potatoes (which are instant), French fries, Cole's slaw or rolls, but the the fried chicken at Go Chicken Go is as good as I have had anywhere in Olathe. The Go Chicken Go building is nothing special, but everything is clean, including the rest rooms. 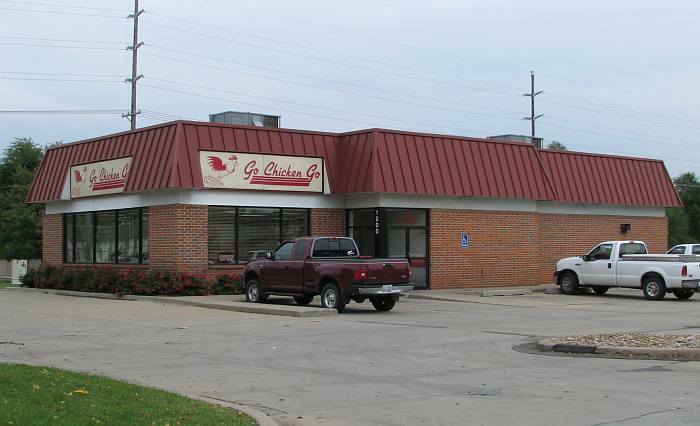 Go Chicken Go offers counter or drive up service. 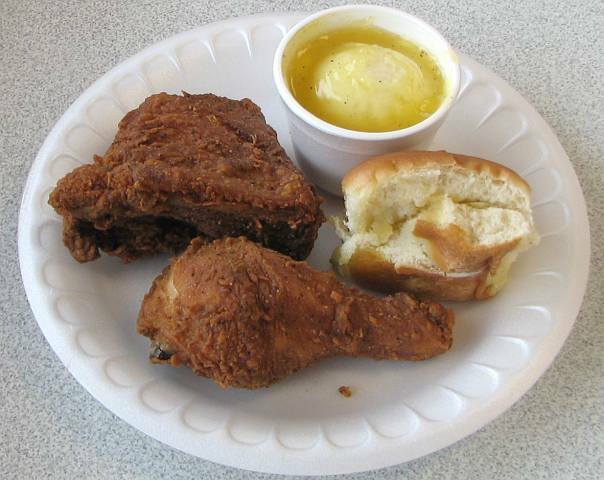 A 3 piece chicken dinner with mashed potatoes, cole slaw and 2 Rolls runs $7.98. 5 wings are $8.93 with the same sides or $6.15 with just a roll. A bottle of the popular Go Chicken Go G-sauce is $3.49. 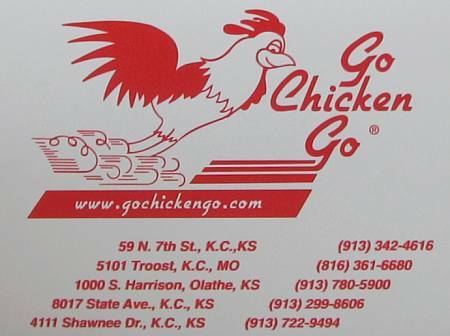 Go Chicken Go has other locations at 59 N. 7th Street in Kansas City, Kansas, 5101 Troost in Kansas City, Missouri, 8017 State Avenue in Kansas City, Kansas, and 4111 Shawnee Drive in Kansas City, Kansas. Of those locations visited, the Olathe one has been my favorite for service. After 3 elimination rounds, Go Chicken Go faced off against Stroud's and had a decisive win with 70% of the 6,600 votes cast on the final ballot. I don't think that these contests determine the best place, but the best known, since many people may vote for one they know, even if they haven't ever tried the one it is up against. That said, both of the finalists are among my favorite places for chicken in Kansas.